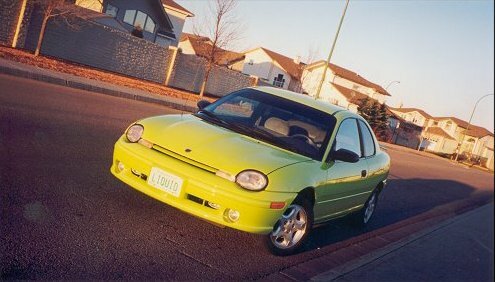 Some Medicine Hat residents may have seen this one of a kind vehicle driving around for the better part of the last 6 years, but the time has come to sell my lime green Neon. As it is 16 years old, this Neon has been through a lot, but has always been very reliable as far as vehicles go. I have personally owned it since 2002, and before that, my sister had owned it for an additional 3.5 years. It has always been well taken care of, lubricated, fluids topped up and washed. There is a miniscule amount of rust on the car and more recently the hood and roof have begun to fade and the clear coat has begun to peel. Additionally, the clutch assembly has recently begun to decline in performance and shifting can be difficult at times. The Neon was checked out at Big Al’s Auto repair Ltd. in Lethbridge, who reported that the clutch assembly may continually decline in performance, but it will not entirely stop working. The Neon is currently located in Lethbridge. Was the main vehicle for carting around my drum set when my band, Minus Shamos, was more active. If you are interested in the Neon, check out the Kijiji page by clicking here. This entry was posted on Saturday, August 13th, 2011 at 10:00 AM and is filed under For Sale. You can follow any responses to this entry through the RSS 2.0 feed. You can leave a response, or trackback from your own site. This is the best worst post on MHM.